Lotus and Pie: Manic Monday? The jog home from work was ok, however I really should have adjusted my backpack before setting off. I was pulling down my t shirt as the straps were not tight enough, therefore it was flopping all over the place. Very annoying! Also, my ear phones kept on coming out of my ears. Aggghhhh!!!! Next time Gadget! Next time! 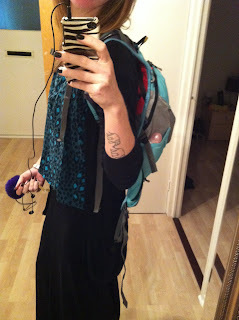 P.s Don't I look amazing in my black maxi and back pack? Very attractive today!